The hat is too big. The man is too small. His animus for the military remains unabated. 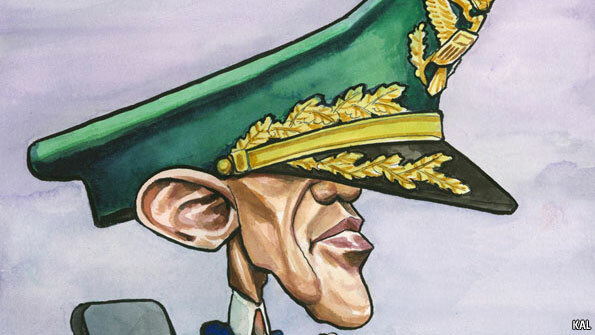 Obama is a deeply flawed commander-in-chief, who believes in a Post Modern America, under whose guidance the battlefield and war have been named 'overseas contingency areas' and he has no stomach to fight a war on terror. No matter how tough he talks or who he bullies, his 'small' hidden persona is always there, and much of America now views Obama as ineffective. Americans can now clearly see the C.I.C. is naked and that just like the picture the hat does not fit. A recent publication of an article in Rolling Stone resulted in the resignation of General Stanley McChrystal over off color and disparaging comments of both Eikenberry and Ambassador Holder. McChrystal voted for Obama. McChrystal was the architect of the planned surge in Afghanistan. Obama waited for for months to respond to his request for troops, and we are still not at the requested surge strength. He is a storied Black Ops Ranger and his unit was responsible for many of the great successes and captures in Iraq. McChrystal is also responsible for many of the varying difficult rules of engagement. The rules of engagement are equal in their lunacy to the infamous novel and movie, Catch 22. The commander in Chief (despite what he said in the Whitehouse Rose Garden ) happily accepted McChrystal's reassignment, and did not offer him a reassignment or another position, in effect forcing a proud warriors retirement. In effect sending a loud message to the upper ranks of the military. Good field generals are hard to come by, and the bench is not deep. The likely choice, to fill this big gap and who Obama Maximus called to rescue our efforts in Afghanistan, is none other than the Commander of Centcom, Four Star General Petraeus, author of the surge in Iraq. This is a demotion for the Centcom Commander and will require him to fill both positions. Before the elections, MoveOn.org ran an infamous insulting full page ad in the New York Times. could operate because it didn’t exist prior to our invasion, that we have increased terrorist recruitment around the world, that Iran has been strengthened, that bin Laden and Al Qaida are stronger than at any time since 2001, and that the process of Iraqi reconstruction and their standard of living would continue to be lower than it was pre- invasion, that if that had been the deal, I think most people would have said that’s a bad deal, that does not make sense, that does not serve the United States’ strategic interests. And so I think that some of the frustration you hear from some of the questioners is that we have now set the bar so low that modest improvement in what was a completely chaotic situati on, to the point where now we just have the levels of intolerable violence that existed in June of 2006 is considered success, and it’s not. 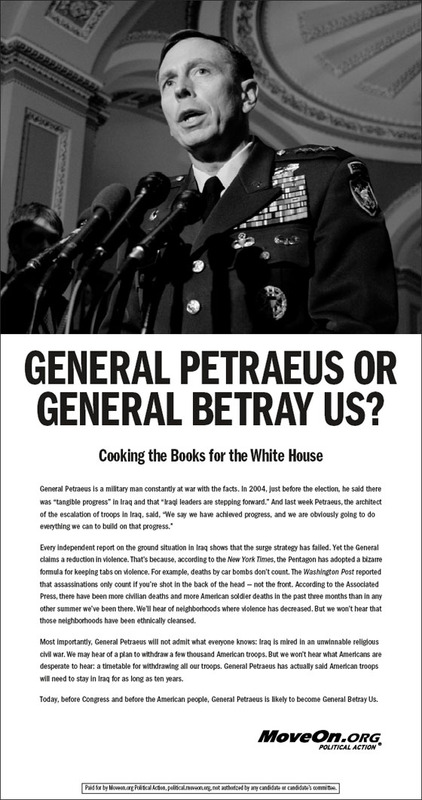 Petreaus was brutalized by MoveOn.org in a full page ad in the New York times, and this week was gracious enough to take basically a demotion to fill McChrystal's swift departure, and save Obama from himself. Hillary Clinton dressed him down in front of the Senate, telling General Petraeus that his progress report on Iraq required “a willing suspension of disbelief,” all but calling Petraeus a liar. None of the Democrat presidential candidates supported it. Obama had voted on another bill half an hour earlier, but didn’t have the courage or integrity to vote to condemn those who attacked a great general at war. He essentially voted “present” yet again. And Hillary Clinton literally voted in agreement with MoveOn.org. The recorded votes of the Senate can be found here, http://www.senate.gov/legislative/LIS/roll_call_lists/roll_call_vote_cfm.cfm?congress=110&session=1&vote=00344if you will note, there were three Senators who did not vote: Biden (D-DE), Cantwell (D-WA), and Obama (D-IL). 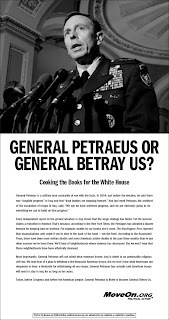 After how rudely those in this administration treated Petraeus in hearings prior to the election, with all of their declarations that the War in Iraq was lost, that our soldiers monsters and that Petraeus' surge would be a disaster, I am amazed this honorable heroic man is still willing to answer his country's call. It is hard to imagine how any military man would be willing to take on this challenge since the Obama administration has set our surrender date as July 2011. Is there anyone out there that can explain to me how Obama is worthy of being Commander in Chief?